Leading two-wheeler manufacturer in India, TVS Motor Company has officially launched its BS4 compliant TVS Jupiter scooter. 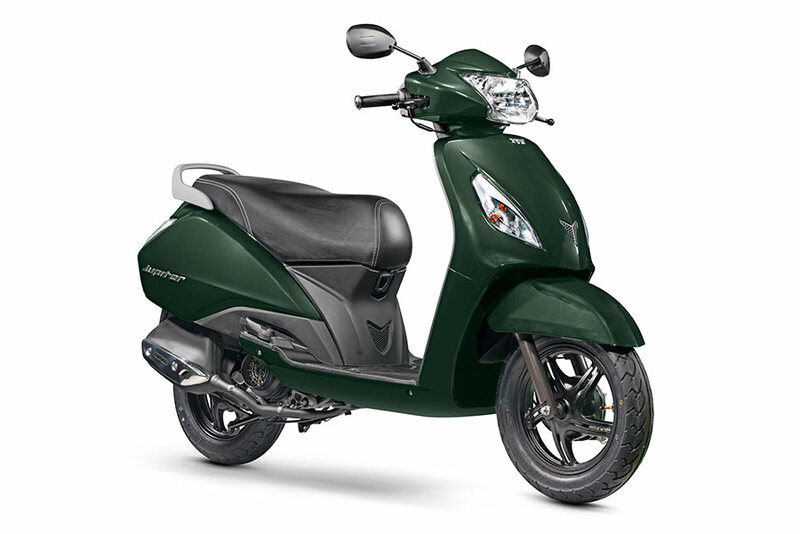 Along with TVS Jupiter BS4 Engine, the scooter is now made available in two new color variants – Jade Green and Mystic Gold. Earlier this month, we reported on 2017 TVS Jupiter BS-IV Engine getting spotted at a dealership. The all new 2017 TVS Jupiter is a fully refreshed scooter and now BS4 compliant engine, with Auto Headlamp On (AHO) and equipped with Sync Braking System (SBS). We assume Sync Braking System (SBS) is something similar to CBS ( combined braking system) which is present in Honda Scooters like Activa. TVS claims the newly introduced SBS feature tries to ensure the rider safety. The SBS feature in Jupiter automatically activates the front brakes when the rear brakes are used. SBS feature which was previously only made available on ZX range would now be available on the base variant of Jupiter as well. TVS Jupiter has received such enthusiasm from the consumers, in response to its credo of Zyada ka Fayda. Living true to this credo not only is the entire Jupiter range now BSIV compliant, it now offers the unique Sync Braking System (SBS) across the entire range (earlier only available on the ZX range). Further, for our customers, we are adding two colours Jade Green and Mystic Gold, giving them 10 colour options to choose from. We are happy to offer all this with absolutely no change in the Ex- showroom price, truly ZYADA KA FAYDA! Since its launch in 2013, TVS Motor Company’s flagship scooter brand Jupiter has been strengthening the Company’s foothold in the scooter market in India and is contributing to overall scooter segment uptake, penetration and growth in India. Currently, there are more than 1.5 million Jupiter customers on Indian roads. TVS Jupiter is powered by a next generation, all-aluminum, low-friction 110cc engine that delivers great power, superior acceleration and best-in-class fuel efficiency. 2017 TVS Jupiter is made of metal body and is styled to have a substantial on road presence. The all new 2017 TVS Jupiter delivers high performance ride quality with superior ride comfort making it a perfect, sensible companion. 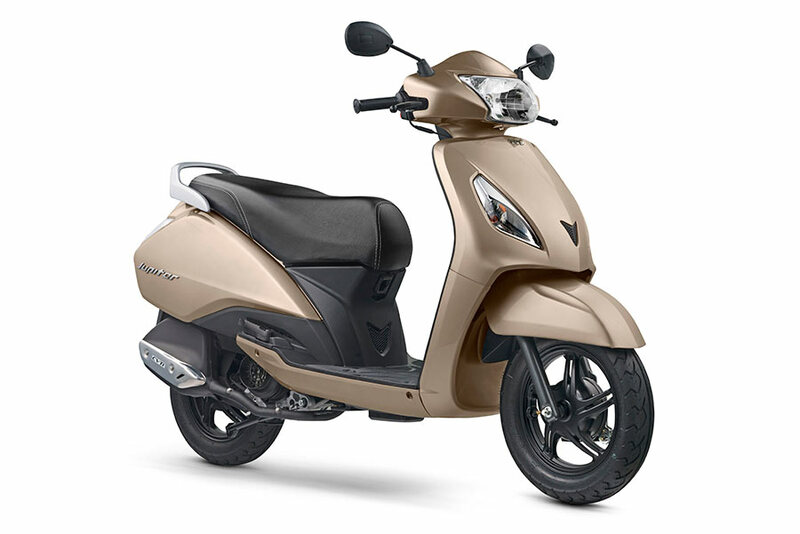 The scooter also comes with TVS patented Econometer, which guides riders in both ‘Eco Mode‘ and ‘Power Mode‘ and the engine delivers best-in-class fuel economy in ‘Eco‘ mode. Good News for TVS Jupiter fans – there is going to be no change in the price of new 2017 Jupiter BS IV models. 2017 TVS Jupiter continues to be priced at INR 49,666 (Ex-Showroom Delhi) and is available across all TVS dealerships in India.